For the fourth time in five years, Larkin and I played in the Petersen Shootout [2010, 2011 and 2012]. We missed last year when Rod kept moving the date around and it finally landed on a weekend when we were in Hawaii. This year, I recruited Gainsley to join us. The foursome got filled out at the last minute by Mike Roessler, the dad of one of Coop and Jack's classmates and teammates on the Jesuit baseball team. After playing in Reno for three years, the tournament has moved back to Carson City. I left Carmichael after 10 am and rolled into the golf course about 12:20 pm. We played the first day at the Thunder Canyon Country Club. After playing with Gainsley on Wednesday, I was stiff as I tried to warm up on the driving range. I got off to a horrible start on the first hole, but settled down a little as the day wore on. 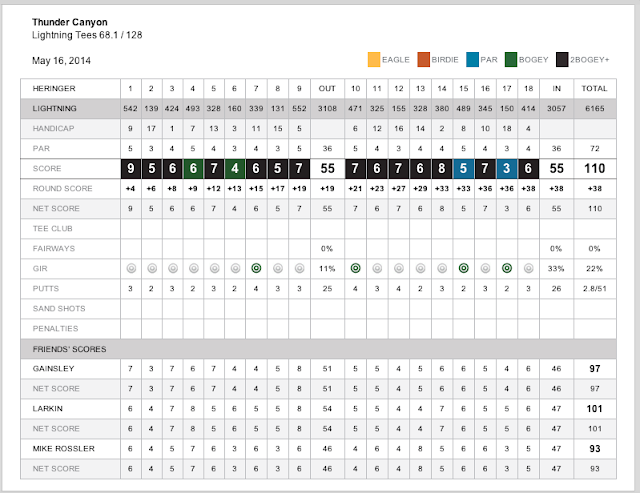 I had a couple of pars on a Par 5 and a Par 3 on the back nine. There was a very stiff wind blowing all day. It seemed to impact my putting as much as anything. I just couldn't find the right speed or line on the greens all day. I swear that the wind was blowing the putts all over the greens. I ended up shooting a liberal winter rules score of 110. Afterwards, we headed to the hotel and got checked in. The group is staying at the Carson Station Hotel in Carson City. Getting cleaned up, Larkin, Gainsley, Mike and I headed to Reds395 across the street for dinner. I finished the evening playing Blackjack at the hotel. They have added a few Blackjack tables and a craps table since we were here in 2010. The group took over most of the Blackjack tables. I ended up playing for almost three hours (about 10 pm to 1 am) sitting next to Rod's brother Scott for about half that time. Starting with a $100 stake, I walked away with $97!? !